In this article we have compiled tips from a team of seasoned SEO professionals with an updated knowledge of contemporary SEO practices and a proven record of measurable success. The majority of articles floating on the web giving tips to improve eCommerce SEO are barely working or outdated. Therefore, we have decided to give some practical up-to-date tips that can indeed help eCommerce merchants to see some solid results. If you were to start building a house without any engineering drawings what would happen to your mission? The same holds true when you start creating an ecommerce website without conducting a thorough SEO audit. An SEO audit is an essential tool to get tips for existing ecommerce storefronts. If you are going to build a new one from scratch, you have to think about the technical SEO considerations right from the beginning of the site development process. This is an excellent tool to find lapses and bugs in code. Good to find missing canonical tags. Good for finding Title tags, Meta descriptions, and Alt tags which are missing or duplicate. Searching 404 error page, de-indexed pages, 302 redirects. 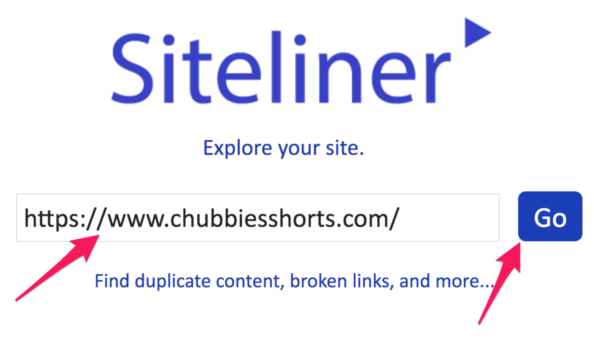 This is the best tool to audit duplicate content on your ecommerce website. Check loading speed and store architecture. Can perform many of the tasks that you can do with the Screaming Frog tool. To do keyword research, most ecommerce SEO experts rely on Google's tool, SEMrush, Ahrefs, and so on. Remember researching your immediate competitors' keywords is highly beneficial for quickly learning the behavior of the search algorithm and success formulas of your competitors. During your keyword research, you may find tons of keywords, and it can be extremely confusing at first. 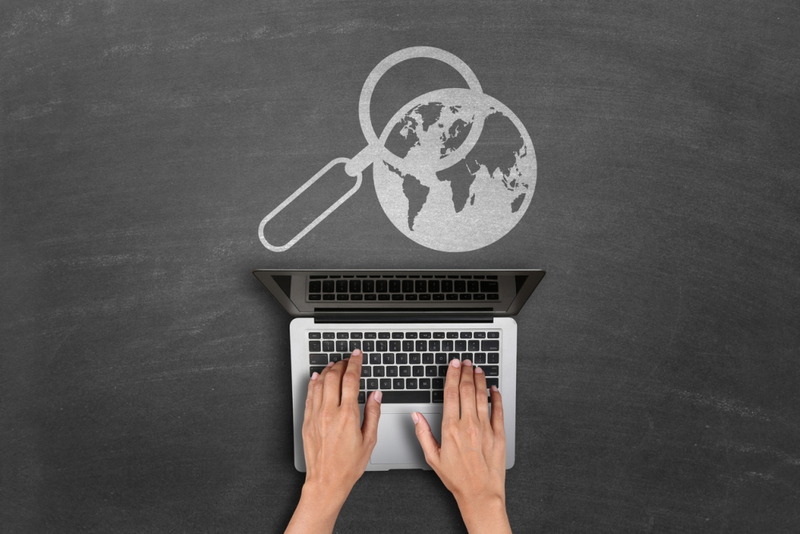 Let's explain how to segregate your keywords with the keyword optimization strategies in mind. Once upon a time, long-tail keywords had a significant impact on search, but with the RankBrain algorithm, search engines became more intelligent than before. Now LSI keywords have gotten importance in ranking. Mid-size keywords have a higher search volume than long-tail keywords, but you have to face more competition that demands more links and quality content to rank. So, leverage it for higher ranking. Latent semantic indexing keywords are synonymous of a primary keyword, and augment the contexts of the keyword use and its placements. LSI keywords make it possible to use long-tail keywords or an entire phase to clarify the contexts of the search. 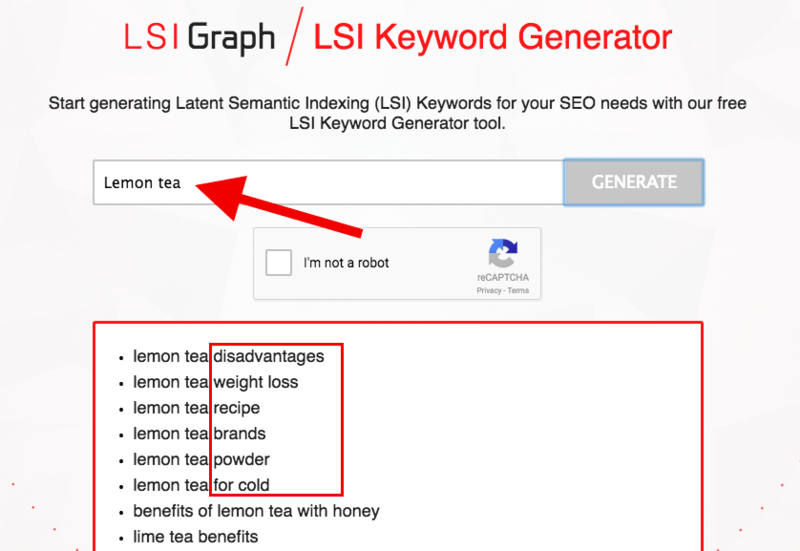 Therefore, by using LSI keyword generators, we can get the right sets of LSI keywords for our primary targeted keyword. 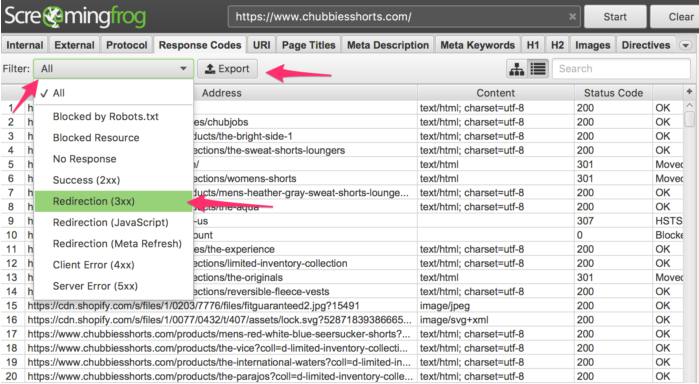 Conversions in ecommerce depend on clicks by shoppers, and a higher Click-Through Rate (CTR) is only possible with optimized Meta tags like titles and descriptions. 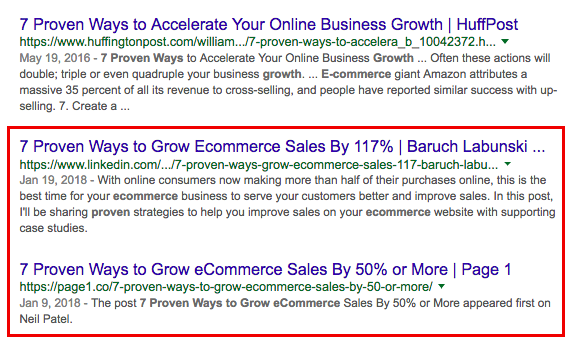 Let’s see how we can optimize title tags for higher CTR. 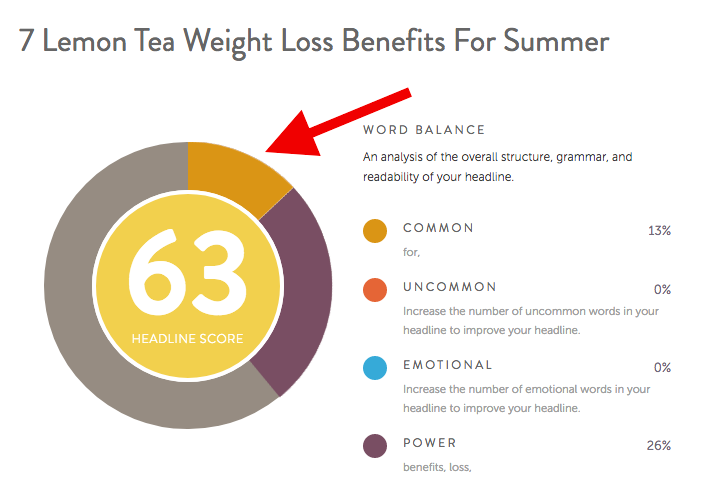 Use Headline Analyzer to do the best title tag optimization. 1. Infuse emotion into your title by using emotional keywords, which will give you more likes and shares on social media. Use brackets in your titles because it gets the immediate attention of readers viewing the SERPs. 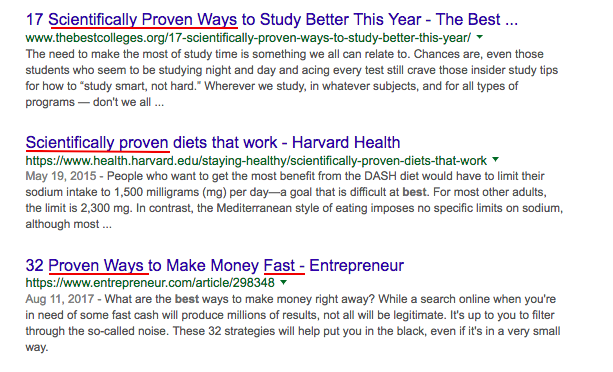 Use power words because they are capable of drawing searchers in and trigger CTA. E.g. Insane, Effective, Case study, Fast, Proven, Best, and Definitive guide. Use figures and facts like numbers and statistics in the title. This impresses and convinces readers at first glance. Description is, as its name suggests, describing the content further like titles or headings. It provides immense opportunity to include your business keywords including primary and LSI keywords to enhance your chances to catch a quality audience, which would read further upon seeing your Meta title. Last year Google had increased its character length cap from 170-230 or so, but today it seems it is again reducing the length of description in SERPs without any official announcement. Well, whatever it may be, the infusion of emotion, information, and relevant keywords certainly improves your ranking, as well as visibility and readability as a whole by giving the right context. Search engines count heading tags as team leaders who represent the entire team. Similarly, heading tags represent the page and paragraphs of text underneath. The H1 tag represents the title of the entire web page while H2, H3 are representatives of paragraphs. Therefore, the best SEO practice is to use H1 only once on a web page and H2 not more than twice or thrice depending on the length of the page. Use H3 and the rest of the heading tags freely by following the hierarchy of the content layout and structure/architecture. You should have it clear in your mind what you want to highlight using various heading tags. Those are not mere paragraph separators, but very meaningful for the readers. Images cover the major portion of ecommerce content. Today images taken from various angles are trendy on product pages because the 3D rotation of a virtual object is costly technology to implement. Images for featured products, upcoming products, and top-selling products like sections all grab eyes and improve the conversion rate of ecommerce. However, images need deep optimization for size, resolution, quality, zooming, and visibility in SERPs. Search engines have devoted an entirely separate section for image searches and results. Bots have gained capacities to index images, text within photos, and context to render its relevance. Today, we have high quality advanced image compression engines available almost free on the web. They produce high-quality images with extremely low size in KBs. Thus, image compression/optimization helps ecommerce pages with fast loading without losing quality at all. Other optimization techniques are to give each image a Title, Description, and Alt tag. These all are ways that crawlers can learn something more about images and help them rank properly based on included keywords. Unlike simpler websites, ecommerce websites have products with tons of attributes. Showing some of the key attributes in SERPs may help you to gain an edge over the competition. For example, the first thing is price, availability, rating, and review data. It is possible to add these attributes with structured data markup or Schema.org integration with your online store, and is best done with the help of experienced ecommerce developers. Write content for ecommerce by following three ‘Cs’: Clean, Concise, and Comprehensive. Write great product descriptions by giving an overview in bulleted points, key features in details, technical specifications, and include mini-FAQ if possible on product pages. Try to place the important content above the fold. Write a concise and engaging introductory paragraph. Content must be error-free, including spelling, grammar, and overall language usage. If possible, secure the help of a professional content writer with SEO flair to create SEO-friendly content for on-page and off-page campaigns. 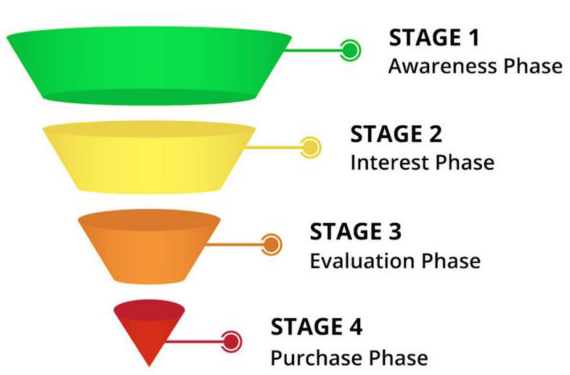 The CTA is the final point where shoppers go to hit the ecommerce goal: conversion. Therefore, the significance of CTA optimization is higher than other SEO practices for your ecommerce website. Let’s check up on the best CTA practices. Make the CTA UI element prominent by applying design techniques including size, color, white space, fonts, and style to improve visibility. Make CTA text and graphics intuitive so they can automatically inspire shoppers to take the appropriate action in favor of the business. Use action words, a sense of urgency, and supporting secondary text to augment your CTA further. Try to integrate various incentives along with the CTA. Ecommerce SEO is a vast subject far larger than we can cover with these top ten tips. You may be best off hiring professional SEO help to achieve the best results for your business and see the most profits from your investment in various SEO activities.